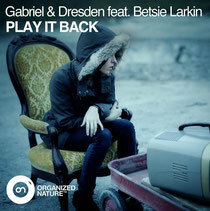 One of our all time favourite production duos, Gabriel & Dresden, return to the EDM fold with ‘Play It Back’, a return to form for the hit-making, award-winning duo of Josh Gabriel & Dave Dresden. Featuring a plaintive, emotional vocal from New York-based singer-songwriter Betsie Larkin, trademark G&D chords and vocal harmonies from the boys themselves, this progressive trance song has caused a stir in G&D's DJ sets globally all summer long. There are two versions of the track: The Original Mix aims squarely at the dance floor while the chilled Gabriel & Dresden Sunrise Mix should wind up or down any party in fine style with a melody that doesn't quit. Gabriel & Dresden formed in 2001 and quickly gained notoriety for both their productions and DJing, scoring hits such as ‘As The Rush Comes’ (as Motorcycle), ‘Beautiful Things’ (Andain) and ‘Tracking Treasure Down’ to name a few. They also scored 21 #1 remixes and tracks on the Billboard Dance Club Play chart and took home numerous awards including IDMAs for Best American DJ two years running. It’s out today.